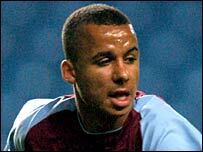 Aston Villa striker Gabriel Agbonlahor has turned down an offer to play for Nigeria. But the England-born player has not ruled out playing for the West African country in the future. Nigeria football authorities were keen on inviting the 19-year-old to play in their final qualifier for the African Youth Championship against Rwanda on 30 September. Agbonlahor, whose father is from Nigeria, has been an important figure in Villa's impressive start to the English Premiership. But the striker wants to concentrate on winning a place in the England team after representing them at youth level. "I could play for Nigeria because of my dad, but I could also play for England and I've already played at youth level up to the under-20s," Agbonlahor told BBC Sport. "I've always wanted to play for England seniors and I suppose the under-21s would be the next step for me. "But I wouldn't completely rule out Nigeria in the long term." Nigeria have recently stepped up their efforts of gathering the country's best talents around the world for their under-20 side. Everton striker Victor Anichebe recently agreed to play for the West African country but Italy-born Stefano Chuka Okaka turned down the offer to play for the Flying Eagles. They will qualify for the 2007 African Youth Championship in Congo if they win their two-legged tie.